Can you see the Epcot fireworks from the Boardwalk? The first thing to understand is that most of the firework in Epcot (Illuminations) are close to the ground. If you are located somewhere around the World Showcase, the view is great. If you are outside of Epcot on Boardwalk or in that area, there are spots where you can see some of the fireworks, the ones that are not at ground level. So, while the fireworks in the Magic Kingdom can be seen pretty well from the Contemporary and Polynesian Village resorts, the Epcot fireworks are not as easily seen from outside the park. 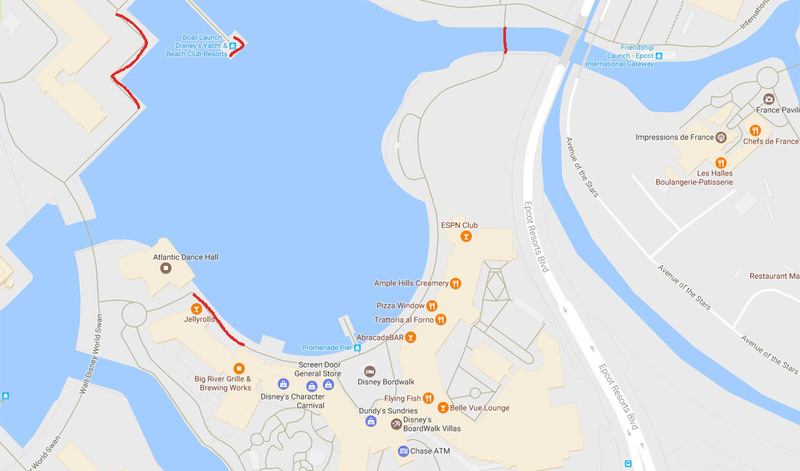 If you want to catch the part of the Epcot fireworks you can see from outside the park, there are decent viewing areas on the Boardwalk near Atlantic Dance Hall or on the bridge that crosses over from the Boardwalk towards the Beach Club and the International Gateway. If you happen to be on the other side of the lake, you can view the fireworks from the Yacht Club boardwalk as well as from the Boat Launch at the Beach and Yacht Clubs. None of these spots can replicate a view from inside of Epcot though. Illuminations can be seen best from inside of Epcot, but on the Boardwalk, they can partially be seen in the areas marked with red.